Even as we’re preparing to welcome 2019 Norwegian Cruise Line announced that it would be shuffling some of its most popular ships around beginning in late 2020. Need something to look forward to? Here are some of Norwegian’s most exciting future itineraries, all of which are currently open for booking! Norwegian Joy was actually the first cruise ship to feature a go-kart track on the top deck. You have to love that this ship, one of the newer members of Norwegian’s fleet, has been sailing from a variety of ports since first she was introduced. Originally designed for the Asian market, the Norwegian Joy will soon undergo a massive refurb before joining her slightly-younger sister, Bliss, in doing Alaska sailings. But beginning October 24 2020, folks in Miami will get their chance to experience everything Joy has to offer. While there, she’ll do a slate of five-to-seven day Western and Eastern Caribbean sailings. Both itineraries will feature a stop at one of NCL’s private islands, with Western sailings hitting Harvest Caye in Belize, while the Eastern Caribbean voyages will stop at Great Stirrup Cay in the Bahamas. After spending her first summer in New York City, Norwegian Encore will hit Miami, ready to sail seven-day cruises to the Western Caribbean. 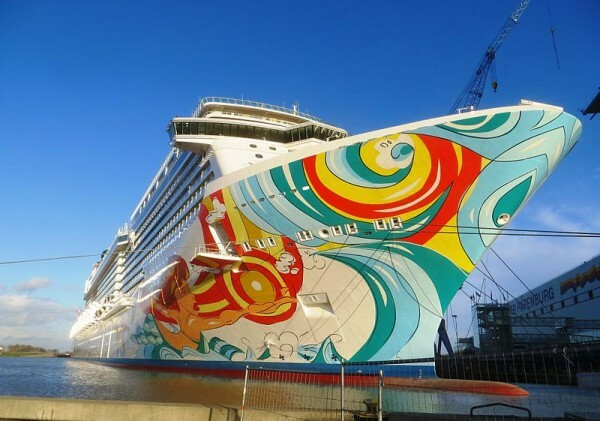 But those looking to spend a little longer on NCL’s newest ship will be able to hop on for 12- and 13-day cruises through the Panama Canal, with stops in Puerto Plata, Dominical Republic; Kralendijk, Bonaire; Willemstad, Curacao; Oranjestad, Aruba; Santa Marta and Cartagena, Colombia; Colon, Panama; and Puerto Limon, Costa Rica. Although the Escape has sailed out of her fair share of ports, late 2020 will see her homeporting out of Port Canaveral for the first time. Once there she’ll do 5- and 7-day sailings to both the Eastern and Western Caribbean. She’ll also do two trips which will be perfect for those looking to do a short trip, with the four-day trips hitting Nassau, Freeport and Great Stirrup Cay. Norwegian Escape’s hull features iconic artwork by Guy Harvey. While the Norwegian Breakaway may have the New York City skyline gracing her hull, she’s happy to bring some of that Big Apple spirit to other cities. After summering in Miami, the ship will return to New Orleans on November 22, 2020. There, she’ll do seven-day sailings to such Western Caribbean hot spots as Roatan Island, Honduras; Harvest Caye, Belize; and Costa Maya and Cozumel, Mexico. Want the perfect setting for your 2020 holiday family reunion? Starting December 20, the Norwegian Epic will return to San Juan, Puerto Rico, to sail seven-day cruises to the crystal blue waters of the Southern Caribbean with visits to Willemstad, Curacao; Oranjestad, Aruba; Castries, St. Lucia; Basseterre, St. Kitts; and Kralendijk, Bonaire. Folks who sail out of New York City have long loved the Norwegian Gem, so they’ll be happy to hear that the mid-size beauty will return to the Big Apple beginning November 30, 2020. Once there, she’ll be cruising a variety of 10,11,12 and 14-day Southern Caribbean voyages with calls to Puerto Plata, Dominican Republic; St. Thomas, U.S. Virgin Islands; St. John’s, Antigua; Tortola, British Virgin Islands; Bridgetown, Barbados; Castries, St. Lucia; Basseterre, St. Kitts; St. Maarten, Netherlands; and San Juan, Puerto Rico. Norwegian Gem has a whole lot of fans who love sailing her out of New York City. 7. But wait, New York… There’s More Good News! 8. Follow Your Bliss… To L.A. Starting October 18, 2020, Norwegian Bliss — aka the sister of Joy — will head back to Los Angeles. Once there, she’ll sail an array of voyages including five-to-seven-day cruises to the Mexican Riviera with visits to Cabo San Lucas, Mazatlan, Puerto Vallarta and Ensenada. If you want an opportunity to really explore this amazing ship (and chillax in the stunning Observation Lounge), she will also sail a few 16-day Panama Canal cruises from Los Angeles to Miami and back, featuring calls to Santa Marta and Cartagena, Colombia; Willemstad, Curacao; Oranjestad, Aruba; Puerto Caldera, Costa Rica; Puerto Quetzal, Guatemala; and Puerto Vallarta and Cabo San Lucas, Mexico. While in Miami, she’ll also sail seven-day Eastern Caribbean voyages with stops in Puerto Plata, Dominican Republic; St. Thomas, U.S. Virgin Islands; Tortola, British Virgin Islands; and Great Stirrup Cay, Bahamas. Want still more options? 2020 will see the Norwegian Jade hitting Tampa beginning November 22 for a series of Western and Southern Caribbean trips that will keep her there through April. Meanwhile, sister ship the Pearl will sail a mix of Western and Southern Caribbean cruises — as well as Panama Canal and Bahamas itineraries — from Miami beginning Nov. 4, 2020. Following a bow-to-stern refurbishment, the Norwegian Jewel will head to Australia and New Zealand beginning October 9 of 2020, set to sail to some of the most beautiful destinations to be found in that part of the world. And starting December 19, 2020, the Norwegian Star will sail 14-day South American cruises with calls to Montevideo and Punta Del Este, Uruguay; Puerto Madryn, Argentina; Stanley, Falkland Islands; Ushuaia, Argentina; Punta Arenas, Cape Horn, Puerto Chacabuco and Puerto Montt, Chile. Once you’ve figured out which ship and itinerary are your perfect match for 2020, you can book right away, as all of these sailings — with the exception of those aboard the Norwegian Jewel, Pearl and Star — are available for immediate booking. As for those three ships, they’ll be available to book beginning on December 21.